Looking for a “unique” gift? Consider purchasing a Greendale "Original" Birdhouse or Greendale “Original” Garden Art House hand built and painted by The Original Village Artisans (TOVA). 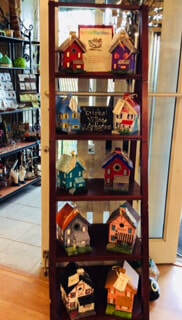 The houses are available exclusively through KitschëCoo Art & Craft Shed. All sales directly benefit Greendale Park & Recreation.